Stop and search: How successful is the police tactic? 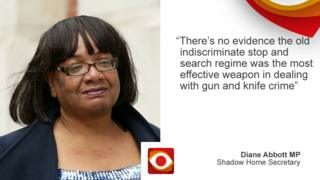 The claim: Shadow Home Secretary Diane Abbott told Radio 4's Today programme there was no evidence the old "indiscriminate" stop and search regime was an effective tool when it came to tackling gun and knife crime.Reality Check verdict: She's right that the old system was less effective at targeting criminals and meant a high proportion of people were being stopped by the police where there was no cause to arrest them. However, in absolute terms, there were more arrests for possession of weapons in 2010 than there were last year. There's been a big fall in the number of people being stopped and searched by police in England and Wales since 2010. This was after reviews of the policy called for a more "fair and proportionate use of the power". But there hasn't been a comparable fall in the number of people being arrested after being stopped and searched. This suggests that the police are now more likely to stop and search people who were then found to be committing a crime than they were in 2010. In fact, the latest figures we have show the year to March 2017 features the highest rate of police stops leading to an arrest since the data was first collected (17%). In 2010, 9% of police stops resulted in an arrest. When it comes to arrests specifically for the possession of firearms and other offensive weapons, the rate is even higher. Last year about 20% of police stops where possession of a weapon was suspected resulted in an arrest. In 2010, the rate was half that. So it looks like Ms Abbott is right that the old regime was not particularly effective at targeting people who were committing crimes. The new more targeted use of the powers means a greater proportion of police stops are of people found to be in possession of a weapon. In London, where there have been 48 murders so far in 2018 - and where Ms Abbott is an MP - the change is even more dramatic. Last year, 33% of stops resulted in an arrest compared with 9% in 2010. Overall there were a similar number of weapon-related arrests following stop and search in 2010 and 2017 (6,671 vs 7,225) suggesting the old regime was far less effective in the capital than the newer, more targeted approach. The Home Office says: "This continues the rising trend in arrest rates in recent years, and supports the idea that the police are taking a more targeted approach to the use of stop and search, and are therefore finding reason for an arrest in a higher proportion of cases. "But we can't say the old regime was totally ineffective. When it comes to the raw numbers, across England and Wales there were more arrests for weapon-related offences in 2010 (13,833) than there were in 2017 (7,794).Since 2013 the total number of arrests as a result of police stop and search has been falling. There were almost four times as many police stops in 2010 than there were last year across England and Wales. And these stops resulted in just under twice as many arrests - so more arrests, but a lot more people being stopped by the police who were not found to be doing anything that would result in an arrest. Whether violent crime is up or down depends on which figures you look at. The Office for National Statistics thinks that overall, all crime including violent crime is falling, but there is evidence of recent rises in certain less common, but very serious crimes, including murder.The homicide rate has been creeping up over the past couple of years, after significant decreases since the early 2000s. But there's no evidence to link this to a fall in the use of stop and search powers. It's very difficult to pinpoint a single cause driving changes in crime.Big reductions to the number of police officers and to forces' budgets since 2010 have piled on the pressure. It's not clear whether that has contributed to the rise in some crimes. » Reality Check: Are there more beds for domestic violence victims? » Reality Check: What has happened to police numbers? » PM speech: Are fewer black people being stopped and searched?